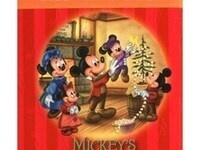 Watch the 1983 Disney cartoon " Mickey's Christmas Carol" on the big screen. Lunch and snacks in the lobby. Balloon animals and face painting. Buy and wrap gifts in Santa's Workshop (with help from the reindeer and elves) and enjoy a very special visit from SANTA CLAUS! Lunch, crafts, and Santa's Workshop open from 11:00am-1:30pm. * Nominal charges for some craft and gift projects.